Ever ran into one of these problems? You want to check out an app, but your device is not officially supported. After flashing a custom ROM, you no longer have Google Play available on your phone. You updated an app, but the new version causes nothing but trouble and you want to go back to the previous version. You want to check out apps without them cluttering up your “My Apps” list and potentially influencing app suggestions. You don’t have unlimited bandwidth at your disposal but want to install an app on multiple devices in your household. Raccoon is an easy to use APK downloader, that allows you to download Android apps from Google Play and cache them to your desktop computer. You can maintain as many caches as you like (for example one per Google Account or one per device you own). 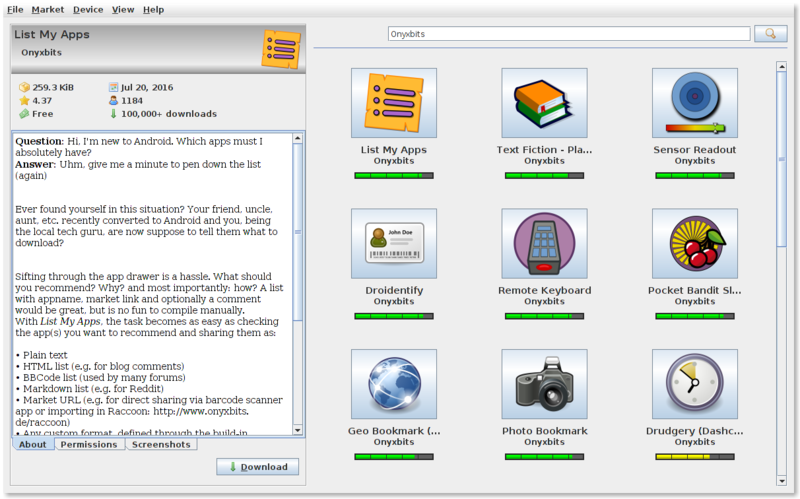 Each cache is able to hold apps in multiple versions. The software comes as a single binary executable and requires the Java 6 runtime or later. If Java is already installed on your computer, you can simply start the application without any additional downloads. Raccoon is primarily a Google Play client for downloading Android apps. But it’s feature set extends way beyond that. Raccoon doesn’t litter APK files all over your hard drive! Push urls to the phone’s webbrowser. Why You need to use Raccoon? Once you hook up your phone with a Google account, things will start to happen, you’d rather not want to be told about. In a nutshell Google monitors your every activity and collects more material than a two-bit gumshoe on a divorce case. Smartphones are all about apps. You download them, you try them out. Some become your daily drivers, others are just fun once in a while, and eventually your collection grows too big to fit entirely on the phone and you start swapping. With Raccoon, swapping is fast and painless. All your apps are backed up on your PC, so you’ll never have to download them again. Unlike APK mirror websites, Raccoon guarantees that you will always get the original APK file of the most recent version of the app you are looking for. There is no man in the middle, you’d have to trust. What is NEW in the current version 4.1.4? Mandatory update. Fixes what v4.1.3 didn’t. BUGFIXES: Downloading (free) apps should work again, no workaround required. Raccoon has to mimic an Android device in order to get service from Google Play. Unfortunately, the Android market is very fragmented and Play will never allow a device to download apps, it is not compatible with. Premium users get to configure multiple device profiles and switch between them at their leisure. 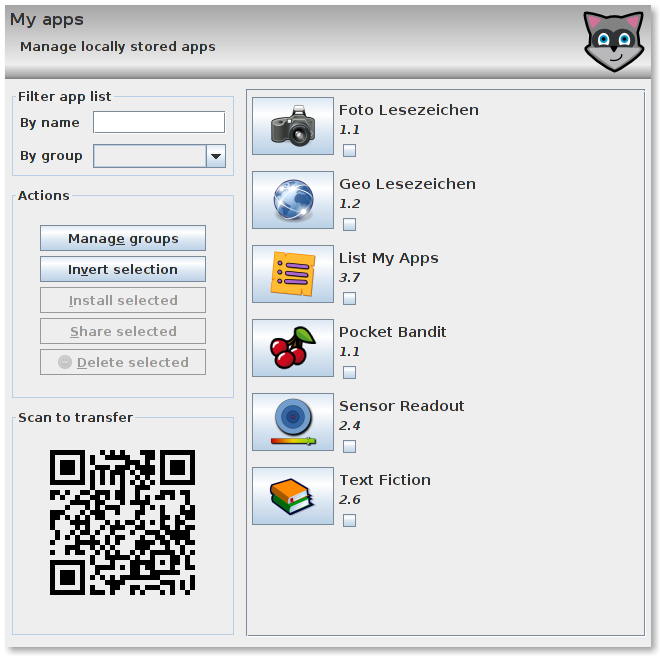 Raccoon comes with a build-in webserver that allows you to easily download apps and other files to your device via WLAN. Raccoon is not just an APK downloader, but also the place to keep all your apps, whether they come from Google Play or alternative markets such as Humble Bundle. Raccoon can send URLs from your clipboard via USB to your device. No receiving app required! Everyone has this problem once in a while: you got this text snippet on your desktop PC that you need on your smartphone. Sure, you could email it to yourself, or you could simply use Raccoon’s general purpose QR Tool to just copy it over. Ever wanted to see what’s inside of an APK file? Maybe extract the soundtrack of a game? Premium users can do exactly that! Searching Android apps with Raccoon works exactly like searching apps with the Play app or via the Play website: simply type whatever you are looking for in the search box. More search results are automatically loaded when you scroll down. Using the ADB (Android Debug Bridge) Tool offers the most comfort and should be the method of choice since it also offers other benefits. Google Play does not allow anonymous access. A valid Google Account is required for every operation, even for downloading free apps. You are strongly advised to register a fresh account exclusively for using with Raccoon. It is an open source,easy to use Google Play desktop client / APK downloader for downloading Android apps on Windows, Mac OS and Linux PCs.